therefore I am not selling left-overs and ready-made pieces, but please feel free to place an order! I currently make plates in 3 sizes: S, M, L. See diameter in cm on above image. Please allow +/- 1 cm difference due to their handmade nature. I make them with either SLIM rim and DECO rim. 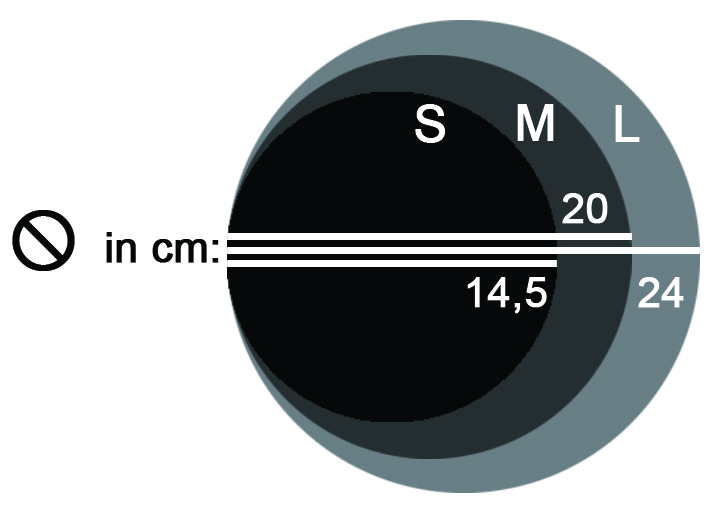 SLIM rim S size plate has just a visual rim, but not measurable. Slim M and L has ca. 1 cm rim around while DECO S, M and L has a wider, ca. 2,5 cm rim which is nicely decorated. See example image below. M/L - regular dining plates, perfect for wall decorations too*. *You can order wallhanging metal backs for size M and L plates from me for 50 SEK/each. This image shows my most common bowl shapes and sizes: S, M, L and XL. I also added the diameter of their opening and their height. Please allow +/- 1 cm difference due to their handmade nature. 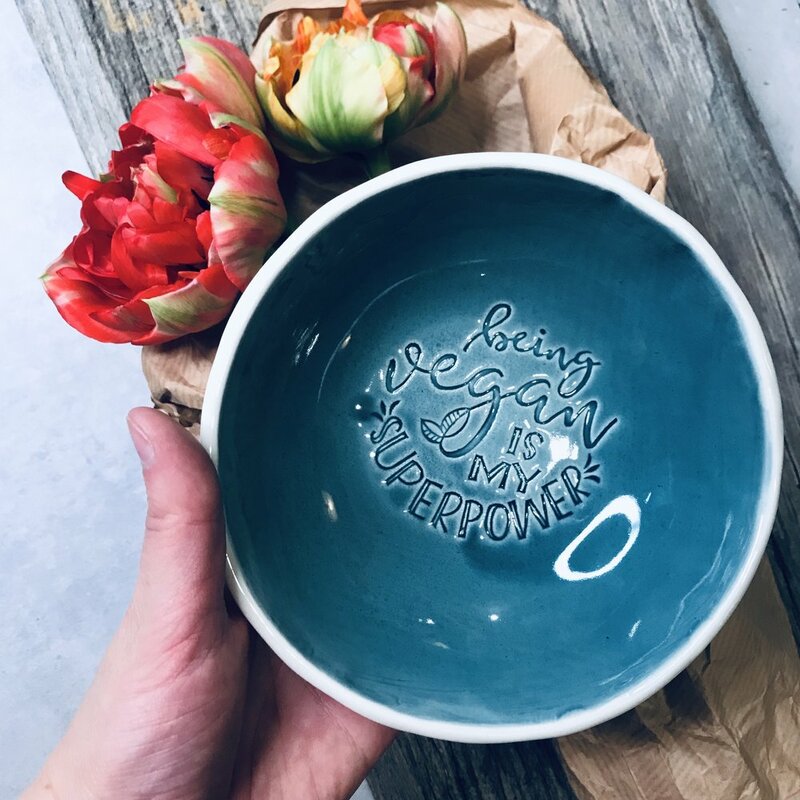 S size bowls are perfect for breakfast, soup, dessert, smoothie bowls, snacks. We use this size at home most of the time. M size bowls are like pasta bowls, but some prefer to use those for soups too. L can serve as a fruit bowl and a bigger buddha/poke bowl. XL works great to display more or bigger pieces of fruits. It can also be a unique center-piece on the table or a fine looking serving platter. Nr. 7, 8, 10, 11, 13 are NOT available in size M, L plates and M, XL bowls. The base (the underside) and the lip (the flattish raised outer part) of the plate is always unglazed, therefore beautiful matt white. 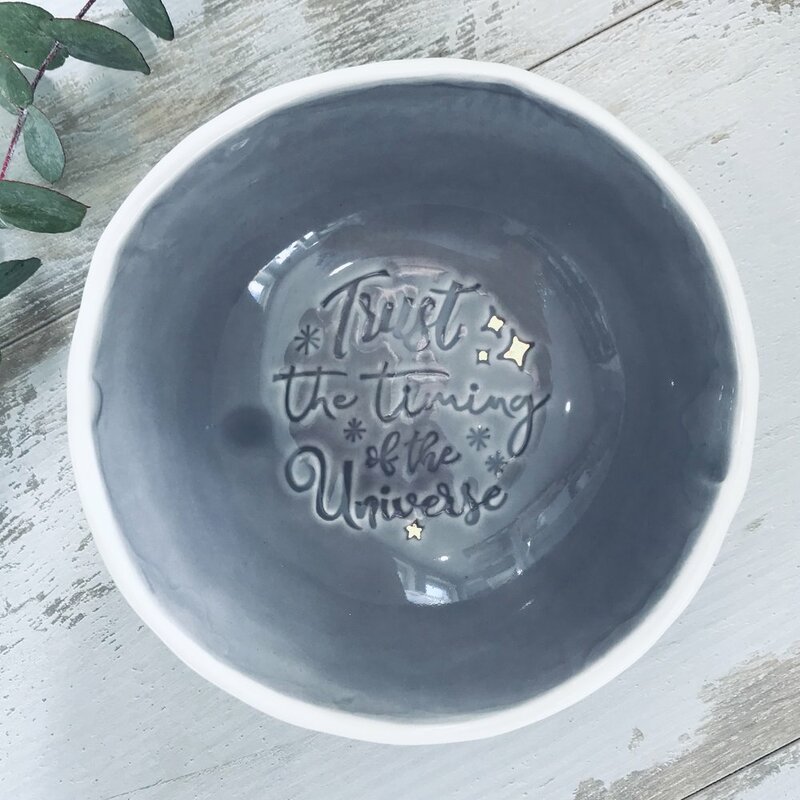 The lip and exterior of the bowl has transparent glaze on the white clay, making it a white glossy surface. You can ask for black speckles or real gold details on the glaze as an extra. Pls note that captions for each photo (specifying size and color) is only visible on a desktop view, unfortunately not on mobile.
! ! ! APRIL OFFER ! ! ! Check out this page further below where I write important information on QUALITY & CARE, PAYMENT, SHIPPING & RETURN. Wait for my confirmation email on production time, total price including shipping, packaging and payment details. Send 50% upfront payment and wait until your order is ready. Can take 3-4 weeks. Once order is ready, photos will be sent to you and rest of the payment requested. Once payment is received, I send your package and email you the tracking number. I update this page every month with ready-made, currently available pieces. Sign up to my newsletter to get notified. One email per month. Plate(s) or bowl(s). Please specify sizes, quantities, text and glaze options. DHL/POSTNORD - I will calculate the shipping cost on your order. Where shall I send your ceramics? If you selected "pick up from Chamotteverket", you do not need to fill this in. What number can I / DHL reach you? After your payment is through (Swish within Sweden, bank transfer outside Sweden), would you need a VAT receipt (momskvitto) or just a regular receipt? Regular receipts will be packed in the box, VAT receipts will be sent via email. What is your VAT registration number ? Please fill in if you are buying as a company and requested a VAT receipt instead of a regular receipt. Thank you! I will be in touch with you shortly to confirm availability and total cost (incl. packaging and shipping). If you live in Sweden, you can pay by Swish. I send you all payment details before shipping your order. I will include your receipt in the package. You can of course also pay by card in my studio or at the markets I sell. If you want to make a payment from outside of Sweden, I send you my company´s bank account details and you can do a bank transfer online from the comfort of your home. It normally takes 2-3 days for the money to arrive. I can send your package once payment has arrived. My safe choice for shipping within Sweden is DHL. Fast, reliable with lots of pick-up points. I like to use DHL outside Sweden, within the EU because they seem to have the best prices on the market. I go with POSTNORD (normal Swedish post) and its recommended mail service to send outside the EU. I wrap every single piece very carefully and 99% of the time they make it in one piece. However accidents can happen, but no reason to panic, your package is insured! I charge 80 SEK for packaging/box, regardless of box size and number of items within box. Good news is whatever happens, your package is insured! So if you receive a damaged box, please take photos of it before opening. If the content of your box is intact, no further action is required. However if the purchased products are also damaged, please send me photos of both the damaged box and the ceramics ASAP. I will make a claim at the shipping company and they will reimburse you. It can take up to 30 days before the money arrives to your account. If you receive a box that is intact but the content is damaged (highly unlikely! ), please also send me photos so that I can make the claim. In case of any of the above I am happy to accept another order from you to replace the broken items while you wait for your money back. When a package is shipped internationally, it may be subject to import taxes, customs duties, and/or fees imposed by the destination country. These charges will typically be due once the shipped goods arrive at the country of destination. Buyer is responsible to pay the additional costs such as duties, taxes, and customs clearance fees. Import charges can vary widely but are most commonly based on the price and type of item, package weight and dimensions, origin country, and the taxes, duties, and fees of the destination country. Please double check with your country´s Customs Service before you place an order. I always send photos and in some cases videos of my ceramics to the buyer before shipping. I make sure to show every item from every possible angle so that you can decide if you want to proceed or not. I do not accept returns or exchanges on any items other than the ones that got damaged during transport and buyer shows proof (photos). The reason why I do not accept returns on items that arrived to buyer intact is that ceramics are very sensitive to ship (back). I am very good and experienced at packaging ceramics in the best possible way to avoid possible damages, however my buyer may not.